Wheel fell off after AA inspection | What Car? Crashing because your car loses a wheel must be a frightening experience. When it happened to Helen McLennan, fear soon turned to anger because just moments earlier an AA patrolman had told her the car would be safe to drive. One Sunday last August Helen and her family set off on holiday in their Vauxhall Frontera. Shortly afterwards we noticed a faint rumbling noise, Helen explained. When the noise became worse Helen returned home and called the AA. A patrolman test drove the vehicle and then jacked it up to check both rear wheels. He suggested the noise could be coming from the universal joint or differential, and the car should be driven to a garage for further investigation. He advised that it would be safe to drive the car a short distance. Within a mile or so of the local Vauxhall garage the nearside wheel came off. The car crashed into a side verge, and it was pure luck that I didnt collide with any other traffic. I was shocked. Another AA patrol arrived and arranged for the car to be towed the rest of the way, while Helen and her family were able to borrow a friends car for the holiday. When Helen returned she faced a repair bill close to 2000. However, after sending an engineer to inspect her car, the AA informed Helen it would pay for the cost of replacement wheels (which the Vauxhall dealer said had to be bought as a set rather than individually), but not her other costs. Helen was furious, and we pressed the AA to reconsider. 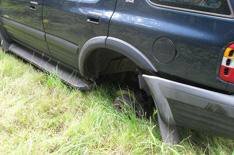 A few days later the AA said it would meet the repair costs in full: We would like to apologise again to Mrs McLennan for any distress caused, but the patrols advice was given in good faith based on his findings at the roadside. The AA also pointed out that it had provided a hire car while the Frontera was repaired (although Helen tells us it had to be returned before the work was finished). Since then, the AA has sent Helen a cheque for 500 to acknowledge the distress she went through. Nonetheless, she remains very disappointed with the AA. 1 Take photographs of any damage at the roadside. 2 Make written notes to help you remember the order of events. 3 Stay calm and be determined but polite when making your complaint.